A nice feature of virtual machines is that you can always restore to a defined state of the test environment with a button click. But sometimes you have to test on physical machines, especially if you need to test graphics related features. My test machine for such purposes is a space-saving but already somewhat older MacBook Air. First: Boot Camp Assistant only offers the opportunity to save Windows 7 drivers on a USB stick. The Windows 7 drivers can be used, so you should store them on a USB stick. If you try to install Windows 8 via Boot Camp on a MacBook Air Late 2010, the Boot Camp Assistant returns an error message that Windows 8 is not supported on this machine. 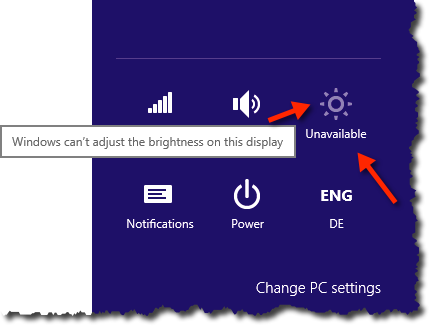 Here are the instructions on how you can still install Windows 8. Important: prior to any experiments, a backup should be made. Developers can download a 90 day trial version of Windows 8 for free from the Microsoft website. This ISO must then be burned to DVD. Mac OS X on the MacBook is booted from a USB drive or USB stick. Then you start the program Disk Utility. 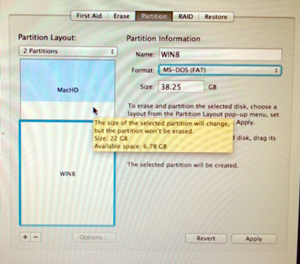 Here the existing partition is resized and a second partition is created as FAT. It makes sense to use a meaningful name (e.g. ‘Win8’) for this partition. Windows 8 requires a NTFS formatted partition. Such a partition can‘t be created by Disk Utility without additional driver, so FAT is used. Then the computer is shut down, the external DVD drive (SuperDrive) is connected, and the Windows 8 DVD is inserted. Hold down the Option key at restart. Launch the Windows 8 installation from DVD. As target select the FAT partition. The partition must be reformatted as NTFS first before the actual installation can begin. After the installation is finished, another important step must be performed. For whatever reason, Windows 8 freezes frequently on a Late 2010 MacBook Airs. This is the time where you install the Windows 7 driver from a USB stick, and it works. In Device Manager, you can see that not yet all the hardware devices are supported. Here one would have the search for drivers from the hardware manufacturer. That was not necessary to run my tests. To be able to choose at boot time between the Windows and Mac operating system, only the Option key must be held down during startup. To be able to restore different defined test environments, there are of course different ways. 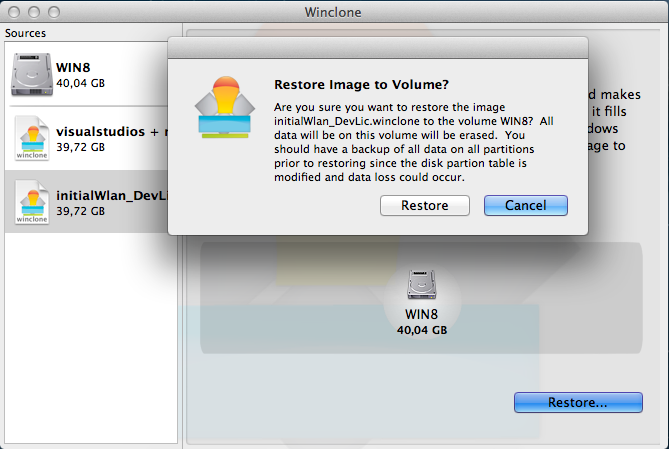 One is to use the Mac OS X program Winclone. This offers to save the entire Windows partition to an image which can be restored any time.